One of my all-time favorite Disney movies is The Lion King. The story, the songs, the animation – I just loved everything about it. While Bubbles has watched a lot of The Lion Guard, she had never sat down to watch The Lion King with me. So when we received a copy of The Lion King Signature Edition on Blu-ray, I thought it was the perfect time to convince her to join me – especially when I added Timon & Pumba’s Hakuna Matata Taters to the mix. These Hakuna Matata Taters (loaded tater tots) are super easy to make – so no worries! They’re a great appetizer for a Lion King movie night, or serve them as an after school snack or as a side with dinner. Bake tater tots according to package directions. Sprinkle with shredded cheese and crumbled bacon. Place tots under the broiler for 3-5 minutes, or until cheese is bubbling and melty. These loaded tater tots were a delicious addition to our Lion King family movie night. I mean, what’s not to love with cheese, bacon, and tater tots? And I am happy to report that Bubbles ended up loving The Lion King just as much as the Lion Guard, and now she has even more context for where those characters came from. 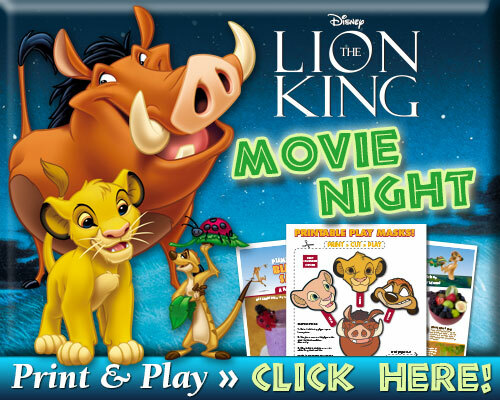 For more The Lion King movie night fun, check out the Lion King print & play fun pack below. The next time I make loaded tater tots (also sometimes called loaded totchos) I will probably add a few more “grown up” toppings, like black olives, scallions, maybe even some beans. Feel free to top yours with whatever you have on hand – remember, hakuna matata! What else would you top loaded tater tots with? Those look so yummy. My kids would love them! I would add some diced jalapenos to mine because I love spice. Logan asks to listen to the Hakuna Matata song every single night before bed. It’s a favorite around here! I’ve had these before and they are SO much better than fries because they don’t get as soggy. I am pinning because I need to remind myself to make these again soon. My kids would go crazy for these, they will eat them and sing the song too. Your Tater Tots look awesome! Thanks so much for sharing with us at Full Plate Thursday. Hope you have a great week and come back to see us real soon! SO cute and looks so tasty! These look delicious! I kind of want to have a Lion King movie night just as an excuse to try these out. Lol. Thanks for sharing your recipe with us at Merry Monday this week! Those look great! Thanks so much for sharing this at the Dishing It & Digging It Link Party. Hope you found some great new friends and had fun.